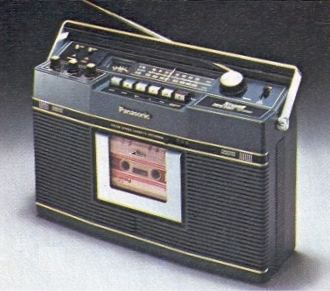 Panasonic Portable FM/AM Stereo Cassette Recorder. Fluid design improves slightly upon the Marantz, but an otherwise insipid format. As you’ll soon see, it wouldn’t take long for Panasonic to come into their own. The Japanese giant’s first offering featured 3 1/2″ speakers, twin volume controls, mic mixing, built-in stereo condenser mics and VU/battery meter. Approx. $150 by 1977.